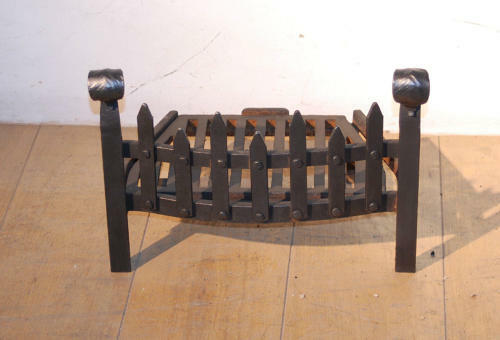 A lovely, petite, fire stool with grill and blacksmith made details. The stool has great design with beautiful, blacksmith made scroll finials on the ends of the legs. The front of the stool has spiked detailing and an open back. The fire stool is in very good condition and ready for use. The colour is good and there is little sign of use and wear. There is some slight surface rust to the underside of the grill. A very pretty item that work perfectly in a small fireplace. The items fine quality and design would fit well with most interiors and provide style and character.